Next time you backpack Europe, it may be a good idea to take along your closest Canadian friend. You just might end up with all the free beer you’d ever want. A public fridge chock full of free beer may sound like heaven to some, but there’s a problem: It’s locked. And there’s only one way to open it—you have be Canadian. The fridge will open only if you scan a Canadian passport. A webcam inside snaps a photo of the passport, unlocking the swill when it recognizes the document as 100 percent official maple leaf. 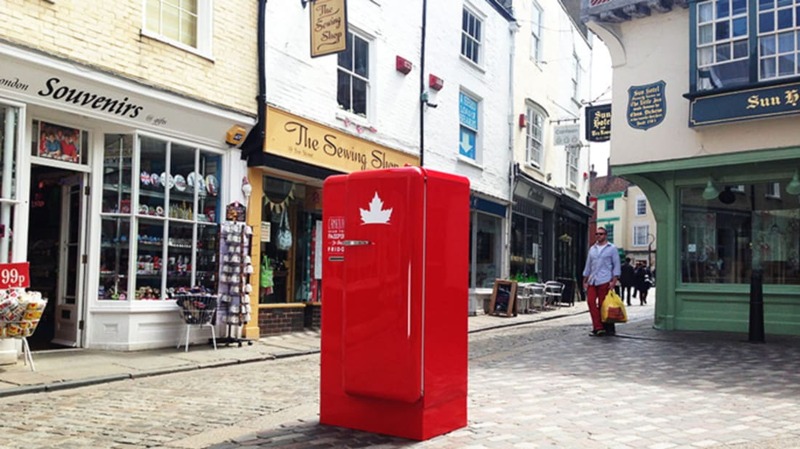 It’s an advertising stunt, of course (Molson recently reintroduced the old “I am Canadian” slogan), but the ad company in charge, Rethink, says that more fridges may be on the way—including at the winter Olympics in Sochi, Russia. Incidentally, if you’re one of those Americans backpacking the continent with a Canadian flag stitched to your bag, it’s time to fess up. Because when a local asks you to open the town’s Molson fridge, your cover will surely be blown.